The absolute cream of the crop of entries chosen from the first 7 years, or 82 KeithSpeaks. This is the good stuff. Laden with so much humor, insight and absurdity, it’s freakish. Even though each entry has a date on it, the entries themselves are not dated. Neat trick in a blog. Self-improvement information and Public Service Announcements destined to make a better you, whether you are looking to be any better or not. The meaning of life (yours). Thought provoking commentary, vacuous observation, and boldfaced lies, side by side - like they belonged together! Some very cool ideas you’ve probably never heard of and might not soon forget. Random exposure to a thousand other incendiary things so sensational (pictures, commentary, critique, movie reviews, etc. ), I’m forbidden to say more. Am too. We also got some very similar reactions that fall under the heading of Who knew? My parents were abducted by aliens. I am only three years old. I can’t reach past the bottom shelf in the fridge. Can you, as a man of principle and integrity, help a nobody like me? You bet I can, Billy! So I got to work and I wrote The Best of KeithSpeak and in an act beyond selflessness, I am dedicating 110% of the proceeds to Little Billy's ‘Bring Back My Parents You Alien Scum’ fundraising telethon (to be hosted by William Shatner with musical guest Rush), because let’s face it, when you’re talking about aliens and parentless three year old prairie children, you’re talking about us! Ok, so now that you know the full tragic story of Little Billy and how he's hungry and all, surely you want to buy a book, yes? If nothing has convinced you to buy The Best of KeithSpeak so far, then perhaps this last thing will as it appeals to a pragmatist’s heart, which I'm assuming you are, pragmatic, if Little Billy's emotionally raw story didn't get you right there, you know? Ahem, the price of this book is at its rock bottom, best deal, lowest price ever. You would be buying at the lowest ever price it's ever been offered at ever! That's making a heckuva deal! If you want to feel good about yourself and the choices you make, now is truly the Best time to buy. When you click on the Buy Now button it takes you to the secure server of our merchant account processor, PayPal. You don’t need a PayPal account to purchase the book. 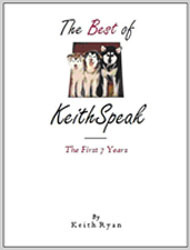 When you complete your order, you will be returned to this website where you can download The Best of KeithSpeak immediately.